All aluminum construction to save weight and ensure strength and durability. Direct bolt on, no drilling through plastics. 3 point mounting system (a pillar, b pillar and under-seat mount to frame). Interchangeable sheet metal and net system. Positive detent spring loaded latch. Much easier exit and entry with suicide opening and state of the art design. These Pro Armor doors are all aluminum construction to save weight and ensure strength and durability for any type of riding or racing. 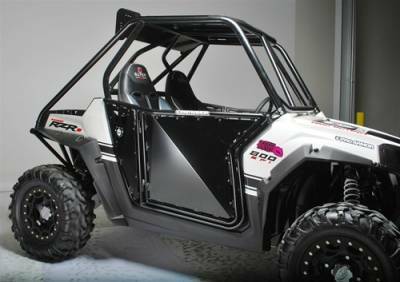 The doors are direct bolt on to your RZR with no drilling. They have a 3 point mounting system making them the strongest and best design on the market, period. The doors are available with sheet metal skins or nets and are fully interchangeable. The latch is a positive detent spring loaded latch which is very easy to use. These doors not only make your ride look that much better with their state of the art design, but also make it much easier to enter and exit your RZR. Installation is a breeze and only takes a few minutes. We offer these doors in brushed aluminum as well, but that must be specified at the time the order is placed.